I have always loved flea market treasures. I grew up near a fabulous flea market and my sisters and I spent many weekend days sifting through table after table of magical vintage finds in that vast dusty lot. Now the market is gone, buried under a shopping mall, but I’m so grateful that it was part of my childhood. It was there that I discovered the way that someone else’s discard can be the very thing that makes your own home beautiful. 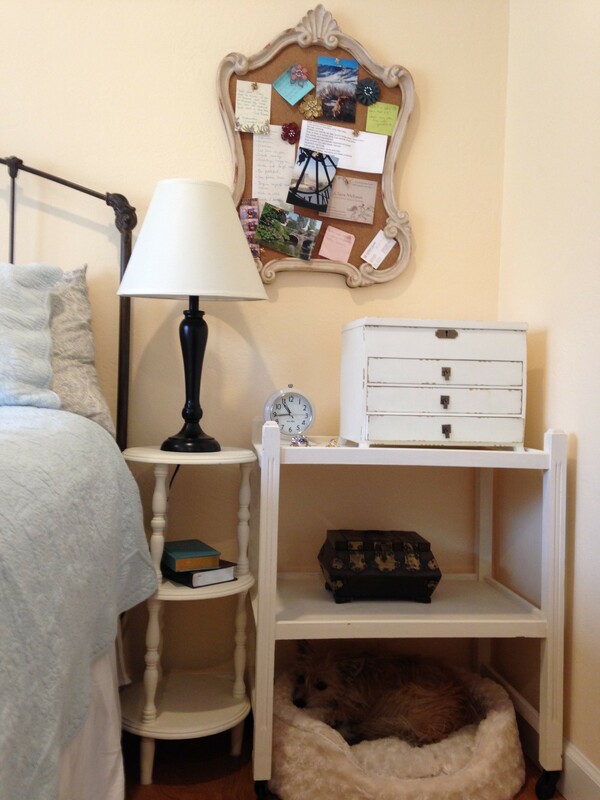 And I also learned that a battered old piece of furniture can be made new with a simple coat of paint. Recently, I rejuvenated a flea market table and a hand-me-down tea cart. 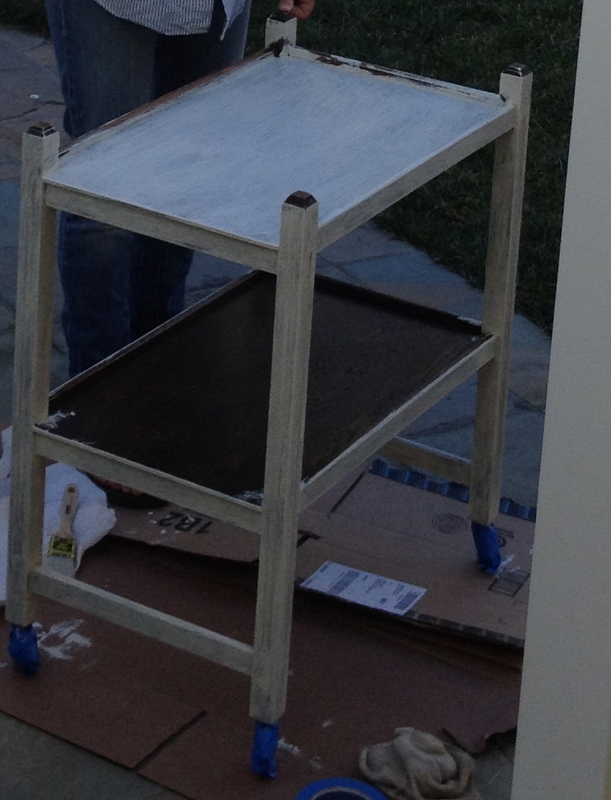 The table was painted taupe and the tea cart had been stained dark brown. I decided to try chalk paint, something I’d only read about previously. I was intrigued by the idea that you could apply the paint directly onto old finishes – I didn’t have the time or patience for sanding and stripping. So I did some research and set off to the only store in my county, as far as I could tell, that sells chalk paint. It’s called Loot and it will probably be the subject of a whole other blog because I love it so much! Here is a link to their blog so you can get a sense of it. Anyway, they have chalk paint for sale there, and it turns out that it really is easy to use! But beware… it’s expensive. You have to balance your loathing of sanding and stripping off old finishes with your budget! The result of the chalk paint is a peaceful matte finish that I love. It would be easy to age, but since I have a young child, a dog, a small house and a clumsy nature, I figured the furniture would probably age itself in no time at all! So I just applied a wax over the paint and have been using my tables next to my bed ever since. The tea cart even doubles as a cozy hide out for my dog. 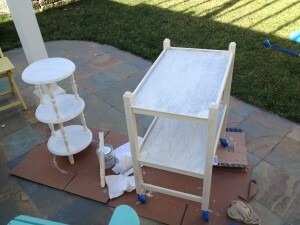 There are recipes for chalk paint. If you’re more adventurous than me you can make your own. Here is one that uses baking soda. Next up on the refinishing list – an old battered pie safe that we use as a bookshelf. I’ve got a wonderful shade of blue chalk paint ready to go. And of course I’ll write a post about it, as soon as I find the time for the project!